Image formation depends on the way light coming from an object is collected and processed. For instance, the cornea and lens focus light waves as they enter the eye, forming an image on the retina. The clarity of this snapshot depends on the quality of the light. Objects appear blurry if the lenses bend light waves too much or too little, something we correct for by using glasses or contacts. Even with these errors, the brain excels at using contextual cues to analyze an image and grasp its concept. The idea of adaptive optics is similar to corrective eyewear. 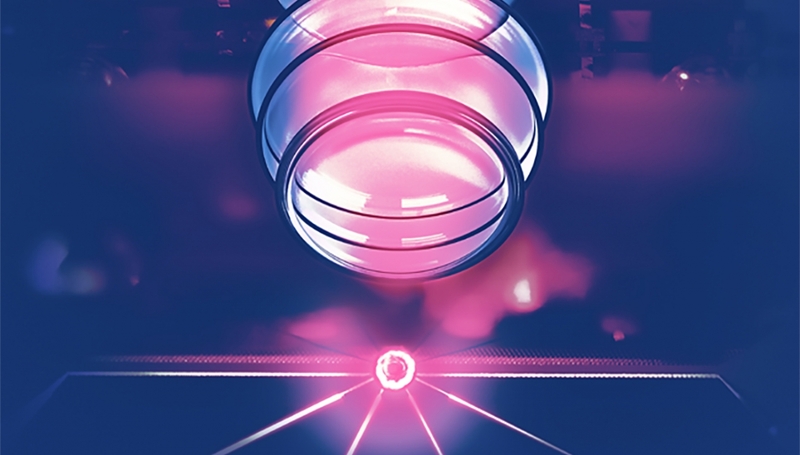 To see a single ion, researchers must collect light from a lone, point-like object hovering inside a vacuum chamber. A laser illuminates the ion, causing it to emit light, which is then collected on a CCD camera, analogous to the retina. But first, the light passes through a vacuum window, two stages of optical magnification, and lenses that correct for astigmatism, all of which introduce distortion. This set of optics, called a microscope objective, combine with a camera to form the effective eye of the system. A computer acts as a brain, processing the camera signal. The researchers characterized the way an ion emitted light by fitting combinations of mathematical curves to the collected data. From these fits, they could determine how to manually adjust the microscope objective’s position to obtain a cleaner, sharper image. Notably, this imaging system was able to detect ion movements of mere nanometers--changes more than 1000 times smaller than the size of a red blood cell. Beyond optimized ion pictures, the team plans to use this sensitive imaging system to measure quantum superpositions of two different motional states of a single ion. And the method, although applied here to atomic physics, could be translated to biology and astronomy, where point-like light sources are also common.